Comes in 4-packs. One can of Propper Starter™ with 16 oz of water will make a 1L starter with a gravity of 1.040. It is recommended to use the 1:1 dilution rate, regardless of the original gravity of your wort. Yeast starters offer higher cell counts at the time the yeast is pitched, leading to faster, healthier fermentations and better tasting beer! They're especially recommended for lagers and any beer that has an original gravity of 1.060 or higher. Shelf life of 12 months. Refrigeration not required. *Note: the use of a stir plate is not required for making a yeast starter, but is highly recommended, as it will further increase cell count through continuous aeration. For recommended stir plates and Erlenmeyer flasks, see below under "You Might Also Need". These are so convenient when compared to making you're own starters. I often make my own starter from DME but this looks like a bit of a time saver. Looks like an easy way to make a yeast starter. Have tried FastPitch and wanted to see how this would do! I have several lagers slated on the brew log in the next few months and I need to make starters to ensure great cell count and better tasting beer. It save me a lot of time. Ease of use. Very Convenient. I've used before and its way easier than making a DME base. I wanted to see if this is saves time. New, I want to give it a try. Simplify doing starters to ensure they're actually done. This really makes starters super easy and quick. Do I no longer have to add yeast nutrient at the end of my boil? BEST ANSWER: I sure would. Get yourself some servomyces packets and off ya go!! Do you need to use fermaid k or any yeast nutrient to the starter with this? BEST ANSWER: No just add 16 oz of distilled water and your yeast and you are good to go. You will need to mix on a stir plate in a flask with the top covered in foil for 24 hours so plan ahead. Fermaid or yeast nutrient are not required. I have used Propper yeast starter both with and without yeast nutrient and have been very happy with the results both ways. No, it contains a yeast nutrient. On the can, it says, "Ingredients: Water, Barley Malt Extract, Nutrient Enriched Inactive Yeast." 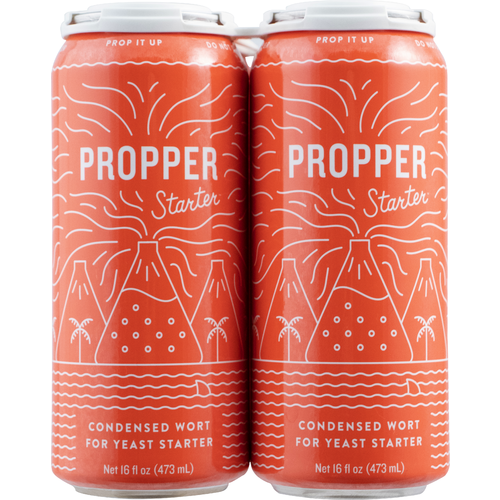 I bought the product for a buddy but he said he does not use any nutrients as the starter wort works well with all yeasts. It's always a good idea to use a yeast nutrient to back up yer hard work . . . and the yeast will love you fer it! No, just add 16 ounces of bottles water and you are good to go. I have and haven't. No noticeable performance difference. No it has yeast nutrients in it already. No it's already included in the can. I did not and it worked fine. Do I have to use sterilized/boiled water for the 16oz of added volume?? BEST ANSWER: Bottled water is an easy source of clean product. Yes you do. You don't want any evil bugs ruining your beer. One can is 16 oz, and the instructions on this page suggest adding 16 oz of water, which would make 32 oz total. This is equal to a quart, not a liter as stated, right? BEST ANSWER: Hi AJ - One liter is equivalent to 33.814oz, the finished product will be one ounce less than a liter. If a liter is 33.814 oz, and a quart is 32 oz, then difference between these numbers is actually 1.814 oz, which is more than one ounce, right? I recently used this product for the first time after acquiring liquid yeast that was over 3 months old. I couldn't believe how easy it was to make a starter. You could save a few bucks by using DME in a traditional starter, but the time savings and ease of use makes this product a no-brainer for me. Works well and very convenient. Takes about 15 minutes to get a starter going as opposed to about an hour the old way. I used the Proper Starter the day before brewing last weekend and it was very easy and hassle free. I definitely will use this produce in the future. Starter fermentation took off within a couple of hours. Really easy to use. My time saved not having to boil up some DME is worth the price. I like not having that extra step of making a starter. This seems to work well. Very convenient, ready when you need it, I used it to start 4 Wyeast packs that were over a year old. Took about 2 days to start working but got them off to a good start. My new packs took off sooner and started working as soon as I put them in the wort. Recommended to anybody that wants a good starter. While you could totally save money by boiling up some dme, for me the time saved is worth the $ of the canned wort. Works great. Hate making yeast starters, always boils over. This is so much faster and easier. Hi Paul - That's great to hear! A lot of customers are enjoying the time savings. Should you go back to traditional starters, AD290 Fermcaps work great for taming starter boil overs. This caned wort is a real time saver! It's concentrated so add the appropriate amount of water to reach your desired specific gravity. I use it for starters and it's a real time saver. Don't forget to sanitize the can opening. I thought this was something worth trying but that it wasn't worth the price. Then I tried it and after not having to babysit boiling DME and cooling before pitching a starter I can't see going back. A little StarSan on the can and some distilled water is all I need and get a nice little chunk of time back. Definitely worth trying and deciding fior yourself. This stuff is a game changer! So easy and works great. I made a starter using this with White Labs WLP029 German ale/Kölsch yeast. It only took 3 minutes to make the starter. White labs recommendations that you don’t ferment this yeast lower than 62° I was able to ferment my Kölsch at 58° SG 1.059 FG 1.008 after primary and diactal rest! I am pretty impressed! time. Makes it quick and easy to get a yeast starter going. Made a 2 liter vitality starter in record time and the beer turned out great. Only slightly more expensive than its weight in DME and worth every penny due to the time savings. This is the only way to fly! Great stuff for a quick starter. If I wasn’t so lazy I’d make a batch myself, and keg it for later use. So easy to pop the top, dilute, add the yeast, oxygenate and start the stir plate. Add the Starter, add the water, mix, add your yeast. It's that simple. I'm so glad that I no longer have to heat water and malt in a flask , cool to room temperature, refrigerate, and warm it up just to pitch my yeast. That's too much babysitting for me. Worked great! Will buy again. I ordered 4 6 packs to share with my brew buddies. I used for a 1L starter of WY1332 & the results were terrific! Almost blew the airlock off my fermentor in under 12 hours! Very easy to use and a timesaver as well.